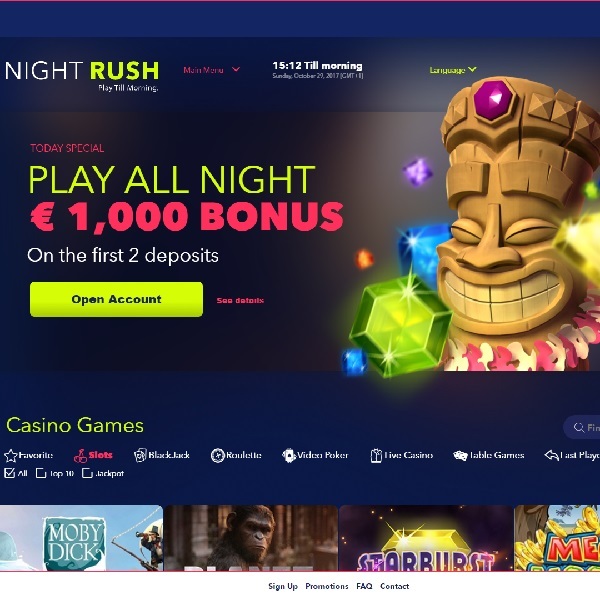 If you like the idea of spending your evening playing top quality games then pay a visit to the brand new Night Rush Casino. The casino invites players to play until morning on games from top developers such as Net Entertainment, Microgaming, Quickspin, Evolution Gaming and more. The games are split into Slots, Blackjack, Roulette, Video Poker, Live Casino and Table Games. Each category is packed with titles to ensure that there is something to suit every taste and that everyone can find something new try. When you join the casino you will be offered a 100% first deposit bonus of up to €500 and a 50% second deposit bonus of up to €500. There are then numerous promotions to take advantage of. The casino has been licensed in Malta and Curacao and offers customer support via email and live chat.